The IHLP-4040ED-5A Inductors feature DCR ranging from 1.05 mΩ to 204.0 mΩ with inductance values of 0.33 µH to 75.0 µH ranging. The units are offered in lead (Pb)-free shielded composite 4040 case with profile of 5.4 mm. They are suitable for filtering and DC/DC conversion in engine and transmission control units, HID diesel injection drivers and HID and LED lighting. The inductors are RoHS compliant and halogen free. 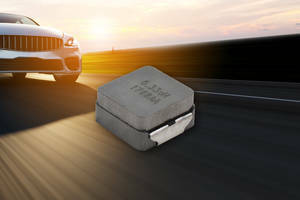 Samples and production quantities of the new inductor are available now, with lead times of 10 weeks for large orders. Pricing for U.S. delivery only in 10,000-piece quantities begins at $0.86 per piece.